This conference has been designed with these two words in mind. It’s time we embrace that we are “NO LONGER”. This phrase applies to each of us differently according to our own struggles. I believe Satan’s biggest weapon is to keep us thinking that we still are…still stuck as we once were. Still trapped in the same: I’m unloved, I’m unacceptable, I’m damaged goods, I’m ashamed, I’m a worrier, I’m useless, I am chained in this sin forever, I have no purpose, I am (fill in your blank.) BUT God’s Word says we are No Longer because of Christ. Ladies, this conference is for you! You are No Longer! So join us as we dig into this truth with guest speaker Joanna Weaver. Let’s free ourselves of these lies that have trapped us because through Christ we are NO LONGER. All registrations will be done online for your convenience. You are responsible to make your own hotel arrangements if you need any recommendations or help with this please contact us. We are looking forward to serving you. If you have any needs or further questions, please call 770-736-2828 or email [email protected]. A special session will be offered for you and your leadership team. Starting at 4:00 on Friday we will meet with Joanna Weaver, our guest speaker. 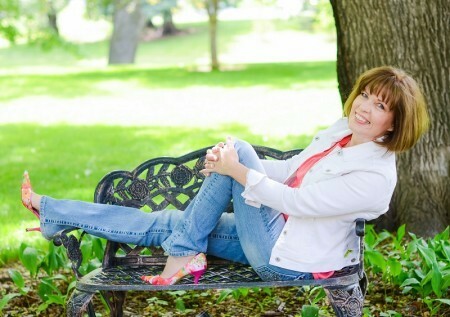 Joanna has been a Pastor’s wife for 30 years, serving in women’s ministry as well as support to her husband and church. She is well qualified to speak to the unique issues those of us in leadership experience. I have asked her to share with us some words of exhortation and encouragement. You don’t want to miss this special time. Please indicate on the registration form of your attendance and any others from your leadership team you plan to bring with you. I am excited about this time I hope you can attend. 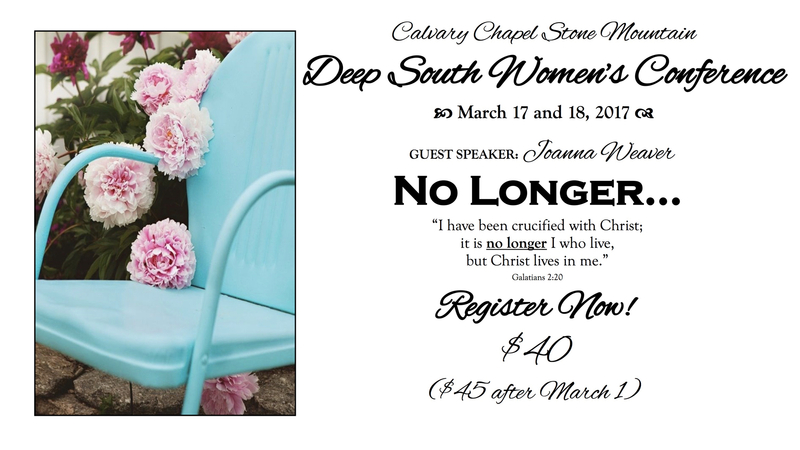 Deep South Women’s Conference is hosted by Calvary Chapel Stone Mountain, GA.
My life is very ordinary, much like yours. God has given me opportunities to travel and speak, write and produce books and DVD studies. But mostly, I do life in Hamilton – a small town in southwest Montana. I’m really just a hick from the sticks! Like you, life keeps me busy. More and more each day, I realize how much I need Jesus in every area of my life. So I’ve made this my one goal – to know Him and be known by Him! I don’t do it perfectly – believe me, I’m a fellow struggler when it comes to carving out time with God. But the same grace that saves us is the same grace that changes us! And oh, sweet friend! I don’t want to miss that for anything in the world. I’m blessed to be married to a Jesus-hearted man whom I adore. John loves me and consistently believes the best in me even when I’m at my worst. I can’t imagine where I’d be, let alone who I’d be without his steady influence and always faithful love. Together, we have three amazing kids. John Michael, Jessica, and Joshua. Both John Michael and Jessica are married to amazing people (Kami Weaver and Loren Downs) and serve in ministry, but Josh is still at home and brings us so much joy! John serves as a lead pastor which is really quite convenient – especially since God called me to be a pastor’s wife when I was sixteen. 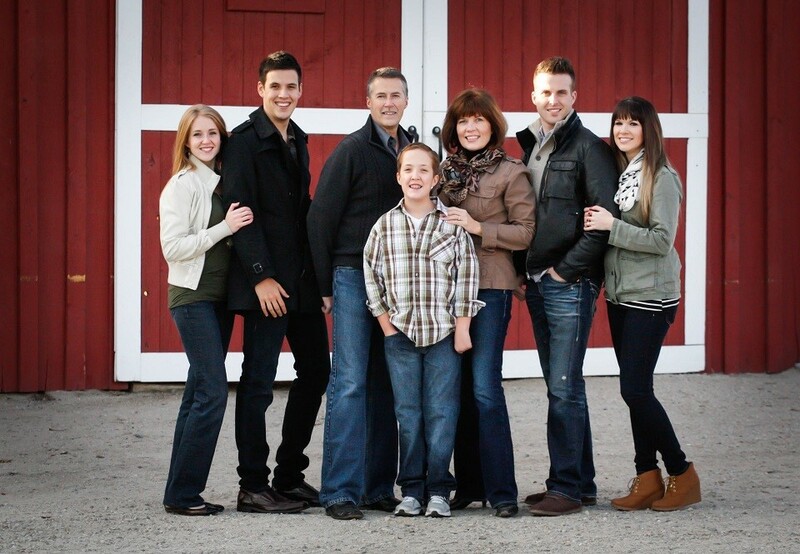 Even after three decades of full-time ministry, being a pastor’s wife is still my greatest joy and central calling. I love loving God’s people.